New Delhi [India], May 27 (ANI): Aiming to empower Nagpur's electric mobility drive, Ola and Mahindra on Friday announced their collaboration with the Government of India in a first-of-its-kind programme to build an electric mass mobility ecosystem in Nagpur, which will bring about a transformational change in the automotive and transportation landscape in the country. The first multi-modal electric vehicle project was inaugurated at the Nagpur Airport Complex by Maharashta Chief Minister Devendra Fadnavis and Union Minister of Road Transport and Highways Nitin Gadkari. "The state of Maharashtra is geared towards driving positive change for collective improvement of the society we live in, and we welcome and encourage such initiatives. In support of this initiative, we have waived off VAT, road tax, and registration for all electric vehicles in the state," said Fadnavis. "There is an urgent need to re-think and revisit transport infrastructure and fuel dependency, not just in India, but globally. Large scale adoption of electric vehicles can bring the monumental change that we urgently need, and in this endeavour, we launched the 100 percent EV nation by 2030 mission. It is heartening to see Indian companies such as Ola and Mahindra taking Government's vision forward and in building a strong ecosystem for sustainable mobility," added Gadkari. This project aims to bring vehicles across different segments, including e-buses, e-cabs, e-rickshaws and e-autos together on the Ola app, enabling citizens of Nagpur to book these vehicles for their transportation needs. The pilot project is slated to commence with a 200-strong fleet, including 100 of Mahindra's new e2o Plus vehicles. The rest of the fleet will consist of vehicles sources from other OEMs including Tata Motors, Kinetic, BYD and TVS, amongst others. Fadnavis and Gadkari flagged off this all-electric fleet from the Dr. Babasaheb Ambedkar International Airport in the presence of key dignitaries and thousands of citizens. 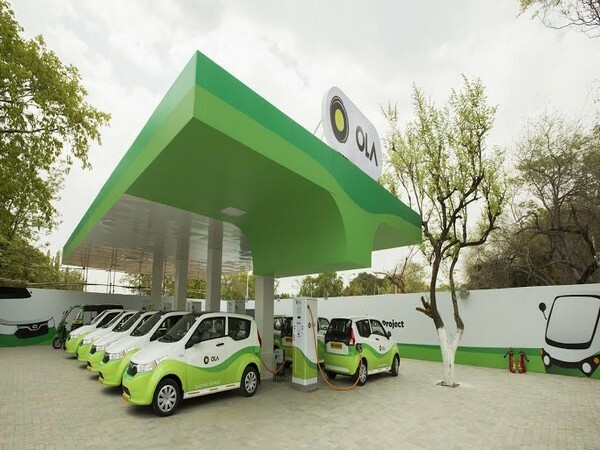 This was succeeded by the unveiling of Ola's electric charging station, situated within the airport complex. This unique installation is the first of its kind and will power the fleet. Ola has already invested upward of Rs. 50 crore towards electric vehicles and charging infrastructure, starting with over 50 charging points across four strategic locations in the city of Nagpur. With a clear focus to build a full-fledged ecosystem around sustainable mobility, Ola will also invest in training and educating driver partners on maintenance and use of in-car technology along with its key OEM partners like Mahindra. "India has the need as well as the potential to set a global example on electric adoption to power its mobility needs. We believe that electric mobility in a multi-modal format will be key towards realising our mission of building mobility for a billion Indians," said Bhavish Aggarwal, Co-Founder and CEO, Ola. "As the pioneers of electric vehicles in India we are delighted to enable first sustainable shared mobility service in Nagpur, along with the Government of India and Ola. True to the spirit of 'Make-in-India', we shall lead this change in India along with the Government. This pilot will pave the wave for wider adoption of electric vehicles," added Dr. Pawan Goenka, Managing Director, Mahindra & Mahindra Ltd.
Electric vehicles will play a major role in reducing urban pollution plaguing several Indian cities and resulting in health hazards. With increased penetration of EVs and eventual 100 percent transition, the country and its citizens stand to benefit tremendously, enabling a paradigm shift in lifestyles - towards smart mobility and smart cities.